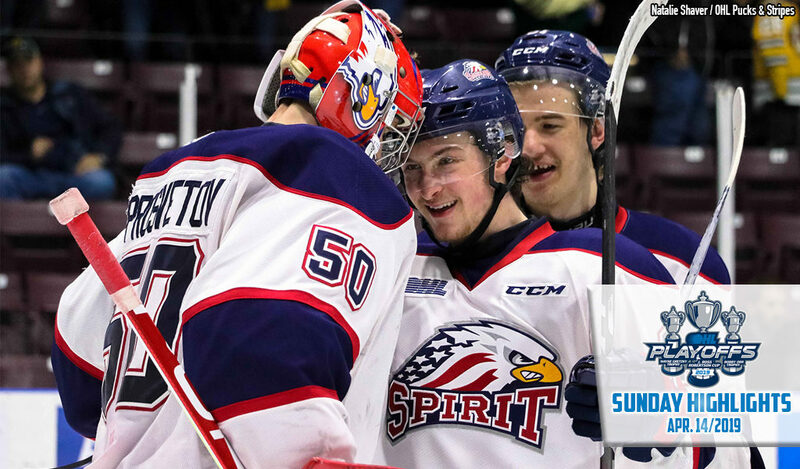 The Saginaw Spirit are into the Western Conference Championship Series for the first time in their 17-year history, eliminating the Soo Greyhounds in six games with a 5-0 shutout on Sunday night. The Spirit best the Greyhounds in a playoff series for the first time in five tries as Arizona Coyotes prospect stopped all 34 shots he faced before a crowd of 4,576 in Sault Ste. Marie. Soo natives Camaryn Baber and Nicholas Porco (3) connected to open the scoring three minutes into the second period with the former feeding the latter off the rush. Edmonton Oilers prospect Ryan McLeod (4) gave the Spirit a 2-0 lead after 40 minutes before captain Damien Giroux (6) made good on a Soo miscue midway through the third. Bode Wilde (6) and Jake Goldowski (2) tacked on empty netters as the Spirit won despite being outshot 34-26. Albert Michnac and DJ Busdeker both had assists for Saginaw as the West Division champions brought Sault Ste. Marie’s season to an end. The defending Western Conference champion Greyhounds were led in playoff scoring by Morgan Frost who sits second in the league with 18 points (7-11–18). The Spirit await the winner of a Tuesday night Game 7 tilt between London and visiting Guelph to determine their third round opponent.